The World Water Congress & Exhibition, hosted by the International Water Association (IWA), addresses an issue of prime importance – the solution of global water problems. Every two years professionals, public officials and innovative companies come together to shape the global water management sector sustainably for the future. 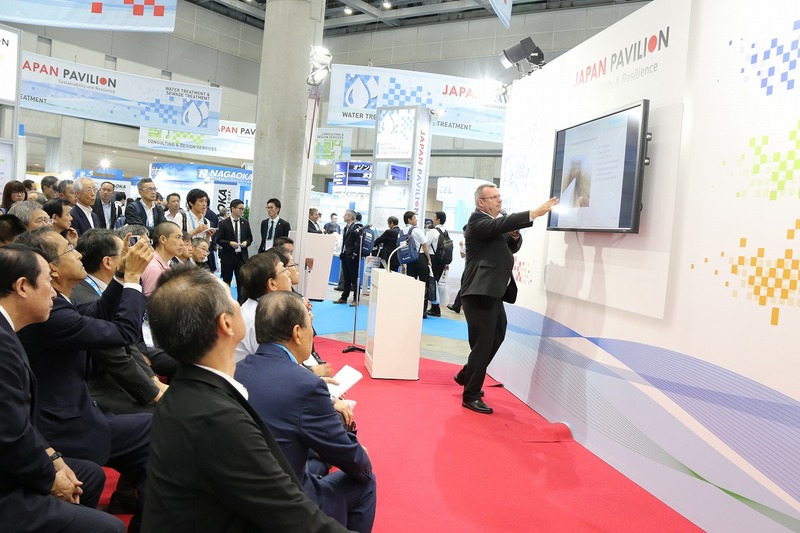 As recognised expert in the field of modern wastewater management, Jörg Steinhardt received an invitation from the Tokyo Metropolitan Government and the Tokyo Metropolitan Sewerage Bureau to present at the Japanese Pavilion at the World Water Congress on 18thSeptember 2018. The technology of the HydroSpin floatables removal was the centre of attention in the Japanese pavilion. 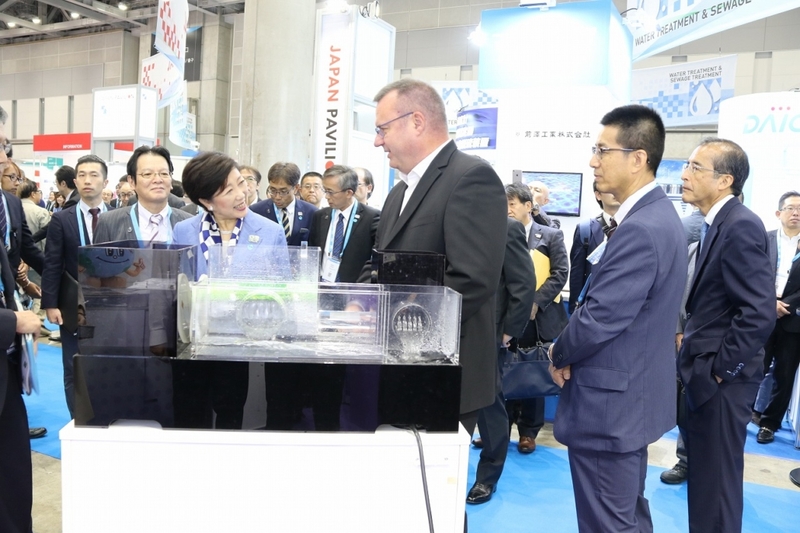 The governor of the City of Tokyo, Ms Yuriko Koike, was impressed by the innovative functioning of HydroSpin, as demonstrated with the aid of the water-driven model. A further subject of approval in talks with Mr. Steinhardt was the ongoing co-operation between the City of Tokyo and Steinhardt GmbH in several international research projects. Mr. Steinhardt’s presentation itself not only clarified the innovative HydroSpin technology but also highlighted its differing applications and the differing formal backgrounds in Europe and Japan. Despite the varying construction methods of the separating structures – the overspill height tends to be higher in Europe – the efficient operation of HydroSpin floatables removal can be observed throughout the world. Additionally, a research programme carried out by the University of Applied Sciences in Munster has proved that HydroSpin, when coupled with flow regulators, is able to cope with larger water volumes and higher waterheads without flooding the WWTP. Thus, the equipment designed by Steinhardt GmbH to fulfil European standards is no less effective than the Japanese original model. In the meantime, the use of a virtual flow modelling programme allows various application alternatives for HydroSpin to be tested for efficiency and optimised before installation takes place. 25 functioning HydroSpin aggregates and over 250 enquiries for the equipment in Germany, France, Belgium and England testify to the success of the patented technology. 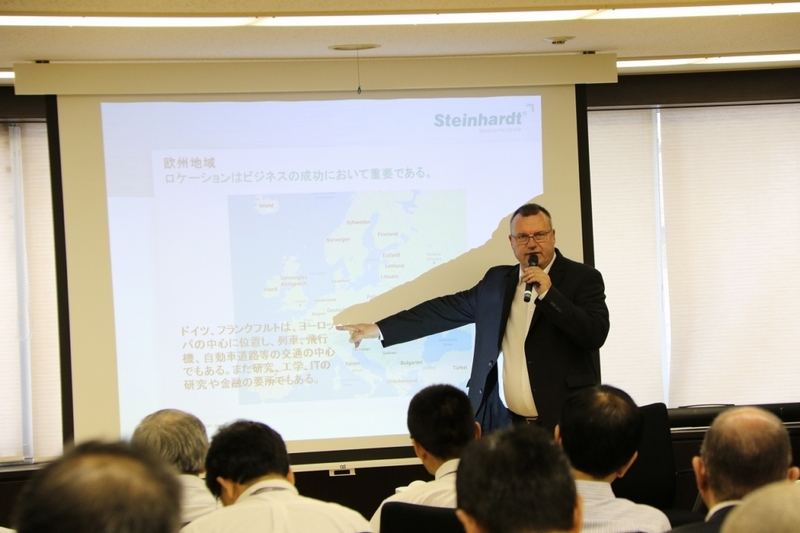 The modification of HydroSpin technology for the European market and the customisation of German technology to Japanese standards formed the focus of Mr. Steinhardt’s second presentation on the afternoon of the same day. 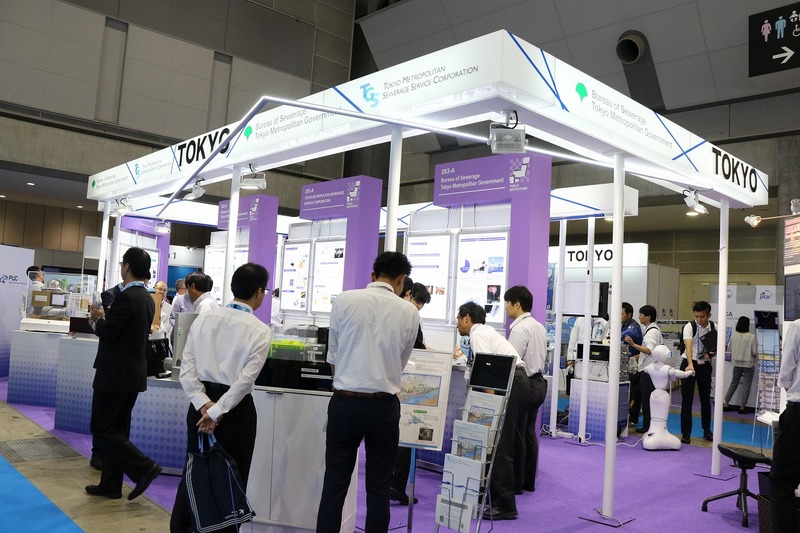 The talk was attended for the most part by professionals from the storm and wastewater technology divisions of prominent Japanese companies or from the Tokyo city corporation. In particular, the audience was impressed by the flexibility of German medium-sized companies that either on their own or within joint ventures or research groups develop their innovative ideas into market-ready products. The structure of the German water authorities, with their decision-making powers widely devolved as far as the bottom-most rung of the ladder, also gained approval from an audience far more used to a strictly centralised hierarchy of authority. At the finish of these two successful events, all concerned were agreed that the exchange of knowhow on an international level is one of the most important components required for the success of efforts to solve the world’s extremely diverse water issues.